Award-winning Vermont director Jay Craven will present his new film, Northern Borders, at 6:30pm on Thursday, August 22nd and Friday, August 23rd at the Contois Auditorium in Burlington, Vermont—as part of Craven’s 100 Town Tour of northern New England this summer. Craven, who is currently featured in Orion Magazine (www.orionmagazine.org/index.php/articles/article/7595/) for his place-based film work, will introduce the picture and lead a post-film discussion. Northern Borders is based on Howard Frank Mosher’s award-winning novel that was recently declared by The London Guardian as one of the “Top Ten Books Featuring Grandparents” (others included Charles Dickens’ Great Expectations and Roald Dahl’s Charlie and the Chocolate Factory). The picture stars Bruce Dern (Coming Home, Alfred Hitchock’s Family Plot) and Geneviève Bujold (Anne of a Thousand Days, King of Hearts). Dern was recently named Best Actor at the 2013 Cannes Film Festival, for Alexander Payne’s new film, Nebraska which he shot immediately after completing Northern Borders. Both Bujold and Dern have received Academy Award, Golden Globe, and Emmy nominations. Bujold has also won an Emmy and Golden Globe. Northern Borders also stars Seamus Davey-Fitzpatrick (Moonrise Kingdom) and 2010 Tony Award nominee Jessica Hecht (Sideways, Friends). Northern Borders tells the story of ten year-old Austen Kittredge, who is sent to live on his grandparents’ Kingdom County Vermont farm, where he has wild adventures and uncovers long-festering family secrets. It’s 1956 and Austen experiences rural Kingdom County as a place full of eccentric people including his stubborn grandparents, whose thorny marriage is known as the Forty Years War. Initially feeling stuck in this fractured household, young Austen plans a quick exit but ends up stranded with no choice but to navigate and endure. A humorous and sometimes startling coming-of-age story, Northern Borders evokes Vermont’s wildness, its sublime beauty, a haunted past, and an aura of enchantment. Northern Borders was produced as the result of a unique partnership between Jay Craven’s non-profit Kingdom County Productions and Marlboro College, where Craven is professor of film. The picture was made as the outcome of a semester-long film intensive called Movies from Marlboro. It was produced on a lean budget, through the collaboration of 20 young filmmaking professionals and 34 students and recent graduates from 15 colleges, who worked in substantial roles in every level of production. A new 2014 Movies from Marlboro project will produce Peter and John, based on Guy de Maupassant’s ground-breaking 1887 novel. That production will again partner professionals and students from multiple colleges who earn academic credit for a “semester away” from their home school. Information is available at Movies.Marlboro.edu or by contacting Jay Craven (jcraven@marlboro.edu). Jay Craven’s Vermont films have been called “New England westerns,” for their larger-than-life characters, archetypal themes involving vanishing ways of life, and their wild and rough-hewn natural settings, where an outlaw culture thrives in the margins. Craven’s films have played in 53 countries and throughout the U.S. and Canada. His awards include two New England Emmys, two National Endowment for the Arts film production grants, and The Producers’ Guild of America’s 1995 NOVA Award for Most Promising New Motion Picture of the Year. Special screenings include The Smithsonian, Lincoln Center, the American Film Institute, Harvard Film Archives, George Eastman House, Cinémathèque Française, The Constitutional Court of Johannesburg, La Cinemateca Nacional de Venezuela, and Beijing Normal University. Northern Borders tickets will be available at the door. Proceeds will pay the film’s completion costs – and help launch Movies from Marlboro - 2014. Cape Cinema screening schedules and showtimes are available at CapeCinema.com. Northern Borders 100 Town Tour schedules are available online at KingdomCounty.org or by calling 802-357-4616. Award-winning Vermont director Jay Craven will present his new film, Northern Borders, at a special screening at Village Picture Shows in Manchester, 7:30pm, Thursday, August 15th. The screening comes as part of the film’s summer 100 Town Tour. Craven, who is featured in July’s Orion Magazine for his place-based film work, will introduce the picture and lead a post-film discussion. For more information go to KingdomCounty.org or call 802-357-4616. Northern Borders is now a film: written and directed by Jay Craven, based on the novel by Howard Frank Mosher! Starring: Bruce Dern, Genevieve Bujold, Seamus Davey-Fitzpatrick Tickets: Kingdom County Productions: http://www.kingdomcounty.org/shop_and_book_us/tickets.php Reception 5:00-5:45 PM Screening: 7:00 PM Screening and Reception with Howard F. Mosher : $25.00 Screening, Reception, Signed Playbill, and DVD: $75.00 This event will be at Lost Nation Theater, Main Street Montpelier Tickets also available at the door. Howard Frank Mosher's Books will be available at the reception and after the screening courtesy of Bear Pond Books. is the author of ten novels and two works of nonfiction. He was honored with the New England Booksellers’ President’s Award for Lifetime Achievement in the Arts and is the recipient of the Literature Award bestowed by the American Academy of Arts and Letters. His novel A Stranger in the Kingdom won the New England Book Award for fiction and was later made into a movie, as were his novels Disappearances and Where the Rivers Flow North. Howard Frank Mosher reads from The Great Northern Express: A Writer's Journey Home. Howard Frank Mosher presents "The Great Northern Express"
From bestselling, nationally-celebrated author Howard Frank Mosher, a wildly funny and deeply personal account of his three-month, 20,000-mile sojourn to discover what he loved enough to live for. Several months before Mosher turned sixty-five, he learned that he had prostate cancer. Following forty-six intensive radiation treatments, he set out alone in his twenty-year-old Chevy Celebrity on a monumental road trip and book tour across twenty-first-century America. From a chance meeting with an angry moose in northern New England to late-night walks on the wildest sides of America’s largest cities, The great northern express chronicles Mosher’s escapades with an astonishing array of erudite bibliophiles, homeless hitchhikers, country crooners and strippers, and aspiring writers of all circumstances. Full of high and low comedy and rollicking adventures, this is part travel memoir, part autobiography, and pure, anarchic fun. From coast to coast and border to border, this unforgettable adventure of a top-notch American writer demonstrates that, sometimes, in order to know who we truly are, we must turn the wheel towards home. Howard Frank Mosher is the author of ten novels and a travel memoir. Born in the Catskill Mountains in 1942, Mosher has lived in Vermont’s fabled Northeast Kingdom since 1964. 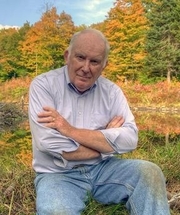 He has won many awards for his fiction, including Guggenheim and National Endowment for the Arts fellowships, the American Academy of Arts and Letters Literature Award, the American Civil Liberties Award for Excellence in the Arts, the Vermont Governor’s Award for Excellence in the Arts, the New England Book Award and, most recently, the 2011 New England Independent Booksellers Association’s President’s Award for Lifetime Achievement in the Arts. We are thrilled to welcome Howard Frank Mosher back to the Andover Bookstore with a reading from this remarkable book, a favorite of staff members Karen and Mairead! Howard Frank Mosher is the author of ten novels and two memoirs. He was honored with the New England Independent Booksellers Association's President's Award for Lifetime Achievement in the Arts and is the recipient of the Literature Award bestowed by the American Academy of Arts and Letters. His novel A Stranger in the Kingdom won the New England Book Award for fiction and was later made into a movie, as were his novels Disappearances and Where the Rivers Flow North. Howard Frank Mosher is currently considered a "single author." If one or more works are by a distinct, homonymous authors, go ahead and split the author. Howard Frank Mosher is composed of 4 names. You can examine and separate out names.